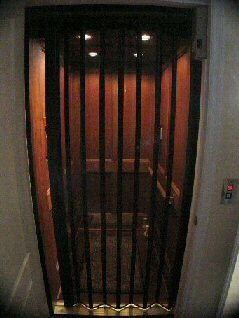 This Custom Design is in response to the burgeoning demand of discriminating homebuyers for high-end custom elevator cars and features. Wood handrails to match your cab walls, with standoffs in bronze or chrome, add an element of safety and security to the ride of your elevator. Polished brass or chrome handrails are also available. A rigid metal scissors-type powdered coated gate is standard on all cabs, except the Estate Ltd. This durable finish is available in Toast, White or Black. All scissors-type gates are hand-assembled with brass rivets. Accordion gates are available on all cabs. 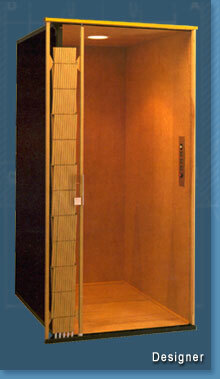 The Telecab, a two stop home elevator. This residential elevator maximizes living space and keeps construction to a minimum by eliminating the need for a hoistway.The Telecab home elevator's modern design suits your environment. It is an economical, attractive and dependable solution, allowing mobility-impaired people to move quickly and easily from one floor to another, with or without a wheel chair. The Designer is our most popular model for those wishing to design, decorate, or enhance their elevator interior.Standard features include unfinished birch veneer walls and ceiling, solid wood handrail, brushed bronze car operating panel, unfinished floor, two 4 inch recessed down lights with white trim bezels, and a scissors gate. Accordion style panel fold gates and other upgrade options are available. Designer interiors can also be specified with melamine finish with a choice of architectural white or natural oak wood grain finish. A variety of attractive plastic laminate finishes are also available to enhance aesthetics and provide an extremely durable surface.